The Horror Movie BBQ: The Power of the Evil Horde Book/Cassette! I'm a big fan of storybook-cassette/record sets from my childhood. I mean, there's so many out there due to their popularity in the 70s/80s/90s that I'm still discovering recordings I've never seen before. I'm talking Real Ghostbusters, The A-Team, Transformers, and so much more. Heck, even George Washington's life got a story cassette! THE POWER OF THE EVIL HORDE! Yes folks, it's so cool I insisted on using colored text. Your eyes don't deceive you. A book/cassette released by Mattel in 1985 dedicated to the origins of the Horde! I had never heard of this tape until a couple years ago, so as a huge Horde fan, discovering this was a real treat. 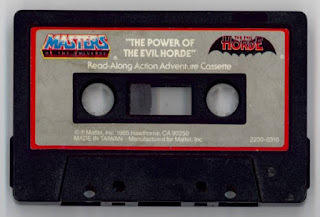 But other than being the story of Hordak and His Homiez, what makes this tape so fantastic? Well for starters, the book itself is illustrated by animation legend Bruce Timm, known for his work in DC Comics animated series/movies. Bruce was actually an artist with Filmation at the time and seemed to be a great choice for this project. 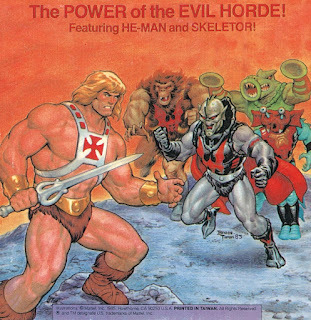 You'll also notice that Filmation (the company that produced the original He-Man cartoon) lent it's voice talent to this project which is an unusual move considering most of these books on cassette were done by no name actors with little to no connection to the cartoon. So to hear John Erwin as He-Man, Alan Oppenheimer as Skeletor, Lou Scheimer as Orko and George DiCenzo as Hordak, amongs other characters from the series, is a real breath of fresh air. On top of that, the music from the cartoons were also included! No longer would we just hear corny synthesizers as the background music and sound effects. It certainly added to the excitement and fun to the story. As far as listening experiences go, it kinda felt like you were listening to an actual episode of the cartoon. Something you should also notice about this gem is that after transforming into He-Man, the muscly defender of Eternia refers to himself as "The Master of the Universe". Which caught me off guard, because the only time anyone used that phrase was in the opening intro, but I never recall anyone actually using it in reference to themselves. So to say that made me mark out, is an understatement. Another fun note is how the Fright Zone is mentioned in great detail. What's always been weird to me is how the Fright Zone was never shown or explored in the cartoon series. I suppose I can see why considering it looks pretty frightening, which achieves it's goal, but I still think it would've made for some fun episodes. But in this story, they narrator and the characters involved go into great detail to describe it. Which leads me to believe this whole story could've been based off an unused script for either a He-Man or She-Ra episode. But that's all speculation on my part. All I can say is thank goodness for YouTube, because these stories make for a fun and somewhat campy listening experience on road trips, lull periods at work, and just when a quick laugh or smile is needed. Add the MOTU franchise and you've got a winner.